We live in a world of labels. And right or wrong, the labels we choose have an impact on how others perceive us — even during the holidays. Even with a bottle of bubbly. So when you bring Champagne to a holiday function know that, like it or not, the bottle in your hand will say something about you. So how do you choose the right bubbly that’s not too cheap, not too extravagant and not too cliché? Happily, sparkling wines have a dirty little secret: To pick the right label, you don’t really have to know anything. You can just ask the experts and, well, cheat. We consulted sommeliers in both Sacramento and New York to provide a no-nonsense, ruthlessly pragmatic guide to pairing the right bottle with the right holiday occasion. This is your official cheat sheet. In The Sopranos, family-head Tony goes to a restaurant with his daughter and her boyfriend. The boyfriend tries to impress him by paying the bill. Tony wants to slit his throat. “You eat, I pay,” Tony hisses. “When you have your own family, you pay.” Lesson: Never show up the parents. To avoid getting your throat slit, pick a bottle that’s classy but not showy. “In my opinion, Schramsberg is the greatest sparkling-wine house in the U.S. 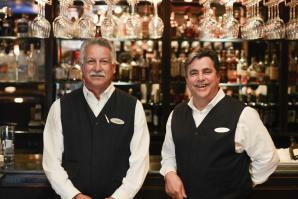 This wine always over-delivers,” says Joseph Vaccaro, wine director for Sacramento’s Ella Dining Room & Bar. This is the time to splurge. Go for an extravagant bottle that suggests your impeccable taste, judgment and worthiness of their corporate largesse. Think of this as the power tie of Champagnes. “My personal favorite for special occasions,” says Vaccaro. “Uniquely fermented and aged in small oak casks, Krug’s Grande Cuvée is created by blending 50 reserve wines from up to 10 different vintages.” So what can you expect for a bottle of grapes that costs more than an iPod? “An elegant, full, round, biscuity nose, followed by flavors of roasted hazelnuts, pear and apple. Loads of bubbles and a long, toasty finish. Simply magical.” Their tagline might be as accurate as it is hubristic: Krug is the Champagne that God gives his angels when they have been especially good. The firm’s partners invite you to a weekend ski retreat. In an ideal world, the right bottle to bring is no bottle, as the ski weekend should be a perk, right? The partners should bring the bubbly. But we don’t live in an ideal world. Etiquette decrees that we bring tokens of thanks, and for a ski cabin full of jet setters, the token can’t be cheap. Think about the destination. “For a ski trip, you don’t want something light and airy. You want something that will go with your roasted quail,” says John Ragan, master sommelier and wine director of the Union Square Hospitality Group. “You can think of wines like the seasons. For snowy weather you’ll want a bottle with a richer, fuller body,” like the Andre Clouet. “If you bring this to a Champagne snob’s house, he’s going to know you did your homework. Avoid the twisted George Costanza logic: If you want a nicer bottle, give me a nicer salary. On the other hand, if you break the bank for a flashy bottle, one of two things will happen: 1) Your boss won’t really be a wine person and won’t know its value, so you’ll have just wasted $100; or 2) She’ll think you’re showing her up. Go for something generous but not over-the-top. Let’s be realistic. There’s probably a large crowd of awkward co-workers, so when you arrive and plop your bottle on the table, no one will even notice. Then again, it should be nice enough to avoid ridicule. “If you’re on a budget, look for the great French sparklers labeled ‘Cremant,’” suggests Vaccaro. “Cremant simply refers to sparkling wines made in the traditional Champagne method outside of the Champagne region.” If you’re trying to ditch the annoying guys from accounting, you can swirl your glass and tell them that the Bertrand has a fruity nose of apple and citrus and chalky minerals with just a hint of lemon rind. You’re buying in bulk, so this needs to be affordable but not too chintzy — nice enough to let your troops forget about last quarter’s layoffs. These are your good friends. If they’re going to judge you for bringing a subpar bottle, then it’s time to get new friends. The goal here is to drink, not dazzle. “On a night like New Year’s, you’ll want to drink a lot. And after the first few glasses, you wouldn’t appreciate the subtleties of finer sparklers anyway,” reasons Sommelier Annie Shapero, founder of the Divino wine consultancy (divinonyc.com). “[The] Washington State winery has been making sparkling wines for more than 30 years. This wine is balanced and smooth on the palate, and it won’t dry out your mouth or dry out your wallet.” Sold. Chris Tucker rolls a lemon across an electric branding iron at Hook & Ladder Manufacturing Co. in downtown Sacramento. 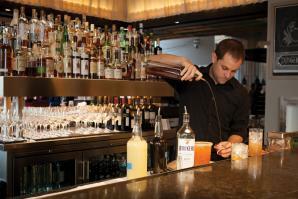 Tucker, the restaurant’s beverage director, began using this signature garnish for a number of craft cocktails after watching a video of a bartender in Japan using a similar technique.